Thank you grandma for keeping a penny jar and teaching me to turn lights off when I leave the room. Thank you grandma for getting on my case when I would say “ya know” after every sentence. Thank you grandma for making me pick up my feet when I walk instead of shuffling. Thank you grandma for telling me not to ‘cackle’ when I laugh, but to pull from lower belly laugh. Do animals in the wild have fatal accidents? Do they perform acts of negligence that lead to an otherwise healthy creature dying? Are humans the only ones who are capable of conscious willingness to deprive their fellow animals of care? We humans have failed our world in more ways than I can count. Today, we have failed specifically a needful dog, his last given name of “Beethoven”. He was failed from a pup, and humans again failed him as an old dog. I’ve fostered dogs and cats off and on for 20 years. There are many sad cases out there, and many happy stories. A local humane society put out a plea for help. They were over-crowded and that only means one thing for these poor, unwanted animals. Through a rescue group I work with regularly, we arranged for me to foster one of their over-flow dogs. 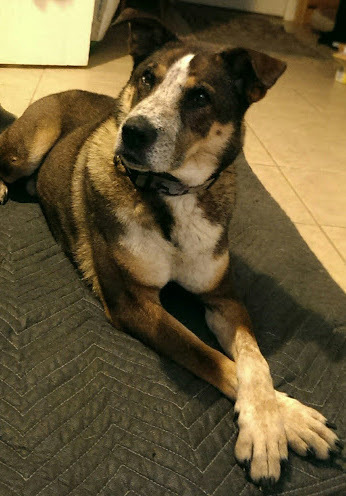 A couple of Saturdays ago, I picked up a sweet but fairly untrained, older Heeler / Husky / Whoknowswhat mix. He had spent at least the last few weeks at two different humane societies in the state. The first was a high-kill shelter, and as far as anyone knew, his only fault was being old. He was a bigger dog than I’ve been fostering lately. Due to Pugsly’s diminutive stature, it’s often advisable to foster like-sized pups. But, the shelter needed help, and he seemed nice, so we all went home. Beethoven had been with us for almost a week. He was clingy and anxious, but cuddly and friendly. He’d been good with Pugsly and with my neighbor’s dogs. I don’t know why he attacked me and my sweet Pugsly that Thursday night. He punctured Pugsly through her cheek into her maxillary sinus. She will be okay, and I can’t capture with words how important that is to me. It was pure luck that I’d changed out of my work slacks and into my sturdy blue jeans. There was not a rip anywhere. My leg is badly bruised, with a number of deep teeth marks, and where the teeth had been against my jeans are bad abrasions. But I didn’t lose any flesh. It was triggered by something deep in his fractured psyche. One hypothesis is that the shelters who housed him accidentally for poor communications doubled up on his vaccines, causing a physical and mental break. Another idea is that he was broken somewhere a long time ago, and certain smells triggered that uncontrollable and terrifying anxiety. Whatever it was, he was a victim. He was a dog. He didn’t have menace or ill-will. He was not angry at me because I didn’t give him an extra treat the night before. He acted on instinct or psychosis. We’ll never know, because we humans failed him every step of the way. I’m sorry, sweet and troubled dog, whoever you were. Animal control picked him up from my neighbor’s fenced front yard that night.